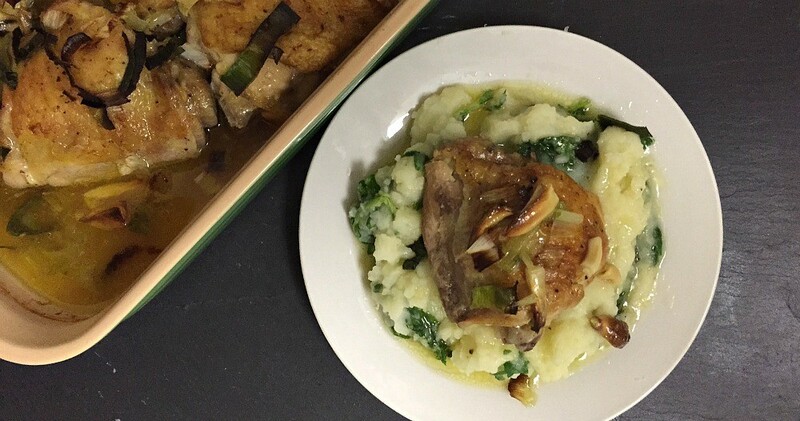 We tried this baked garlic chicken thighs recipe with leeks for dinner, and… WOW. 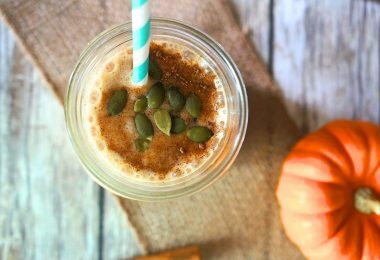 I’m working with Cans Get You Cooking as a Canbassador to share recipes and ideas using canned foods. You all have to try this easy chicken dinner recipe at home! Last week… oh last week. It was pure bliss. Christmas time always means love, celebration of life, and tons of time with family and friends. Y’all know what else comes with all of this? FOOD. 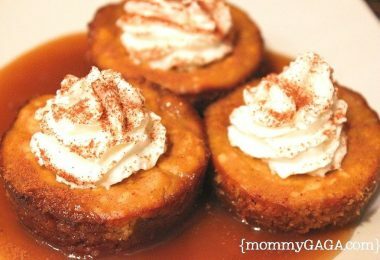 Well, extra time with loved ones means more time in the kitchen. 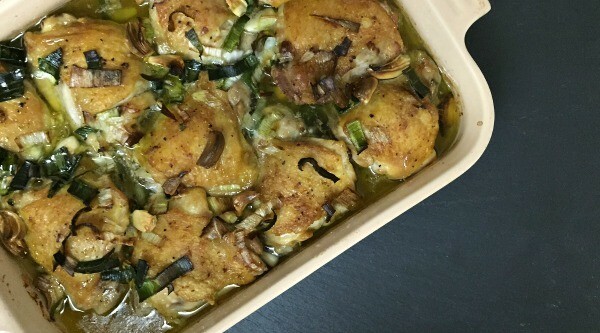 I saw a recipe for 40 clove garlic chicken and I thought HOLY WOW, I have to try something like this! 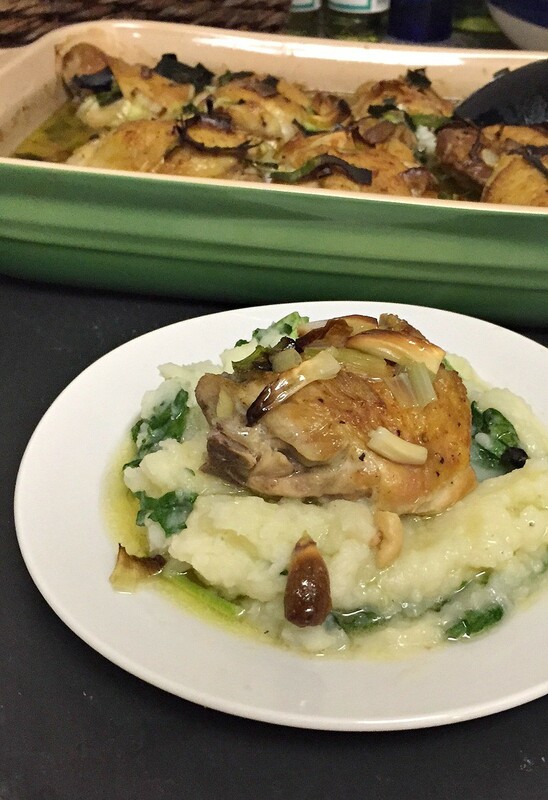 After making a few adjustments to the recipe that would work for my family, making this baked garlic chicken thighs recipe and mashed potato dinner dairy-free, a little less garlicky and full of flavor. I used canned kale in the potatoes and canned chicken broth instead of milk or cream, and everything turned out amazing! 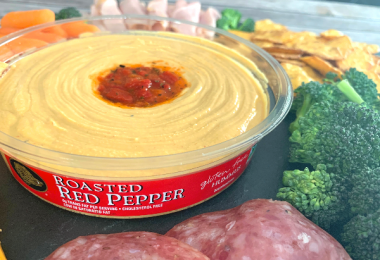 To begin, so start by preheating the over to 450 degrees. Wash, pat dry, and season chicken thighs with salt and pepper. 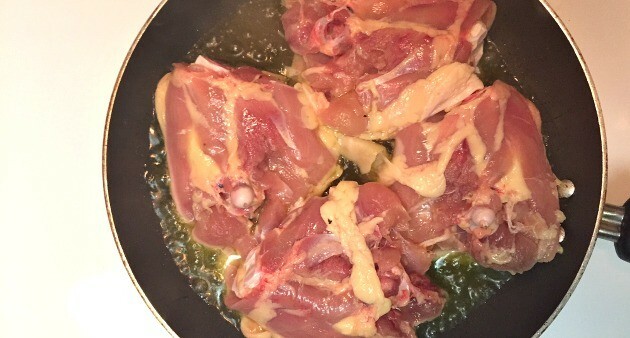 Heat olive oil in a skillet over medium and place chicken into the pan, skin side down. Cook each for 7-8 minutes, or until the skin is browned. Then, while the chicken is browning, cut each garlic clove in half long ways, to make 20 pieces of garlic. 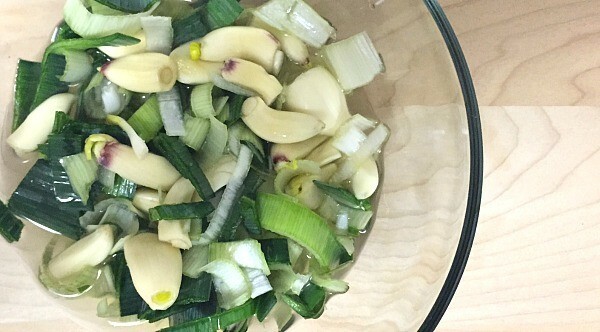 Combine in a bowl with 1/2 cup chicken broth and leeks. When the chicken skin is brown, place chicken pieces skin side up into a casserole dish (this Le Creuset casserole dish is my absolute favorite!). DO NOT DISCARD THE OIL, rather, turn the stove heat off and add the garlic and leek mixture to the pan. Stir to coat, scraping the edges of the pan to get all of the chickeny goodness, and pour the mixture evenly over the chicken thighs. Bake for 28-30 minutes, or until juices run clear. Next, make your mashed potatoes how you normally would, boil the potatoes, mash and add butter, kale greens, chicken broth, salt and pepper to taste. I really love how this baked garlic chicken thighs recipe turned out, I couldn’t wait for it to cool so I could make my plate! 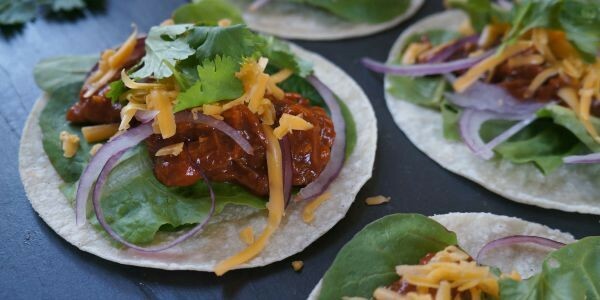 It’s super easy to cook with canned foods, saves time and still possesses the flavor and nutrition you’re looking for when you eat vegetables. With less prep, I’ve got more time in the evenings to put a healthy, homemade meal on the table! 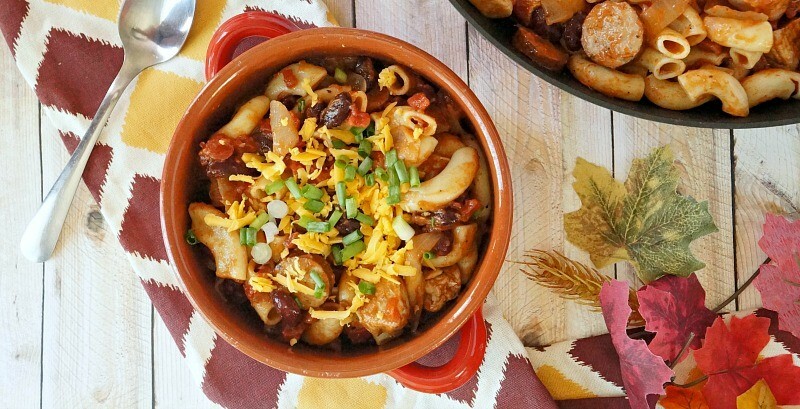 It’s easy, tasty and affordable to get cooking with canned foods! To learn more about the benefits of cooking with canned foods, visit Cans Get You Cooking and their Facebook, Pinterest, and YouTube pages. Disclosure: I am participating in the Canbassador Program with Cans Get You Cooking. I am being compensated for my time, however all opinions are my own. I have cooked with canned food for years! 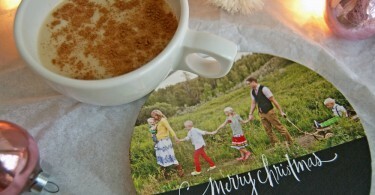 Make Your Own DIY Holiday Photo Coasters: A Great Last Minute Gift! 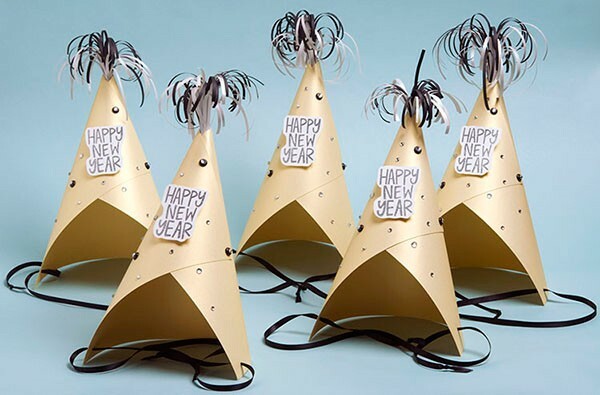 5 Fun New Years Eve Crafts For Kids To Ring In The New Year!